Bring your large group of family or friends to this four-bedroom, three-bath stunner. Marvel at our 180-degree view of breaking waves while dining and relaxing on the deck or in the great room. Flat-panel TVs throughout. Less than 10-yr.-old vacation rental with wireless Internet, an outdoor hot tub (seats 4-5), upstairs and downstairs living rooms with fireplaces, full kitchens, ovens stove tops. High-end, hotel-like furniture. Everything for cooking, serving gourmet meals. On the quiet West side of Santa Cruz, by the popular West Cliff ocean promenade. You look over one rooftop to enjoy the ocean. Great bakery, coffee shop, and outdoor jazz up the street; a Safeway store, the best Italian (Ristorante Avanti) and Chinese (Omei) restaurants a half mile away, plus all restaurants on the water by the Pier. In addition to its great view of the waves from on high, this newer vacation rental has a wireless Internet, an outdoor hot tub (seats 4-5), two fireplaces (upstairs and downstairs), high-vaulted ceilings, a great sound system with 4 in-the-wall speakers, DVD players in all rooms, granite counter tops, island with bar stools, a large dining table, new appliances, and everything for the gourmet cook. Walk North along the ocean 1/4 mile to Natural Bridges State Park, or South to the lighthouse and the Boardwalk of Santa Cruz. Enjoy TVs and DVD players in all 4 bedrooms. The house has 3 full baths with showers, 2 with tubs; an outdoor shower on the lower deck for surfers, and a large library of good books for non-surfers. Handicap-accessible, baby crib, sheets, blanket provided. I owned a small bungalow on this prime lot just off West Cliff Drive and rented it to summer vacationers in the '80s and 90's. It became such a popular vacation rental, I did a tear down and built a whole new, tall, two-story home designed for vacationers who like to cook, serve, and enjoy meals together. Thus, the table seats nine, great cooking gear, serving platters provided. Every time I drive along West Cliff drive to upgrade this vacation rental, which I do a lot, I find peace, joy, and exhilaration in the Santa Cruz coastline. I've traveled in Ireland, Italy, France and South America, and I think the views you see while walking along West Cliff drive beat them all. Views, walk along the ocean, fine bedding, everything a cook could desire for food prep (a Kitchen Aid mixer! ), serving, barbequing. Nice linen napkins, place mats, skillets, dishes, cups and wine glasses. From the upstairs deck, living room, master bedroom you will see surfers. Fabulous walk along West Cliff Drive, 2.5 miles to the Boardwalk, whales and wildlife along the way. Only one house rooftop between us and the ocean. Great views from our tall, two story house and large deck. See surfers. From the upstairs deck you have a 180 degree view of the ocean, the sight and sound of waves. Often, you will see surfers. (2) One large refrigerator with ice maker upstairs and a small refrigerator downstairs. (2) Microwave both upstairs and downstairs. We have a full kitchen upstairs and another stovetop, oven, microwave and small refrigerator downstairs. (3) Lots of great movie CDs available. DVD players in every bedroom, both living rooms, upstairs and downstairs. Upper deck has a fantastic view of the ocean. New, seats up to five. Stunning view. Newly built, for vacation renters. One king, two queen, three single beds, one fold-out single futon. Hot tub; two fireplaces, kitchens (one up; one downstairs); outdoor shower; DVD players; large library of good books; baby crib provided; desk. The large deck has a fabulous gas grill and outdoor dining. Gourmet cook's dream: all equipment, including Kitchen Aid mixer. Comfortable seating for large group in the great room, at the counter, watching the cook(s). 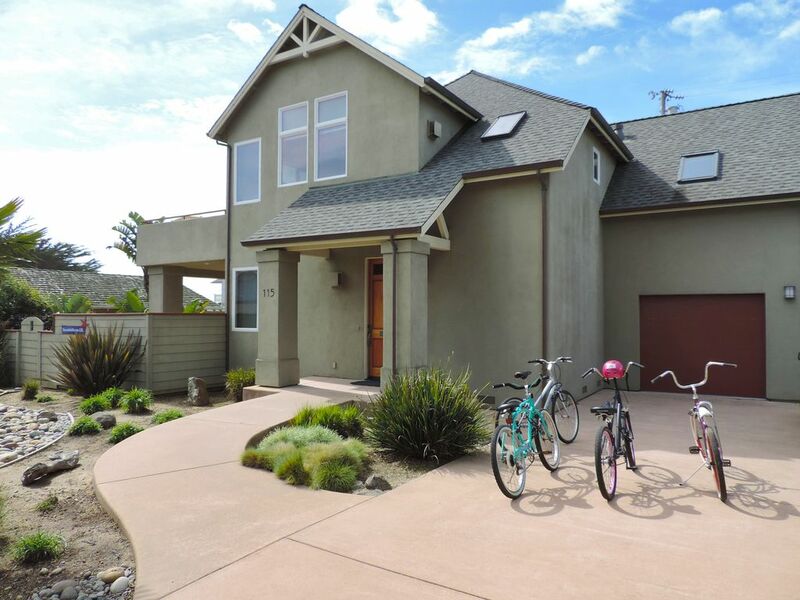 Awesome house with everything we needed for a good time with family in beautiful Santa Cruz. The views are amazing and the beds are comfortable. The spice cabinet was stocked as was the rest of the kitchen. We will surely be back for another trip. Westside was wonderful...great location, spacious, clean and so well appointed. There were lots of amenities and whenever we needed anything, it was there and easy to find. It was easy to see that much attention was paid to detail. The landscaping was very attractive and well kept; furniture was comfortable, both inside and out; the kitchen was well appointed and had everything you could need. This is the place we'll stay the next time we visit Santa Cruz. Fantastic ocean view, very comfortable & spacious home. We stayed here for a workshop at UC Santa Cruz and there was ample space for 7 adults, with everything we needed in the kitchen. The bikes are a great addition - the coast path is just at the end of the street, with Natural bridges to the right and a stunning walk towards the boardwalk to the left. We highly recommend this property. Great house, lovely location. We really enjoyed our weekend. This property and location are amazing! It is a short walk from West Cliff drive where we enjoyed many walks and beautiful sunsets. The home itself was so comfortable and well appointed. My family is already asking when we can return! Walk out your front door to West Cliff Drive and a sea-level experience of the ocean. Walk or bike along West Cliff Drive, above spraying waves. One-half mile to Natural Bridges State Beach; many other beaches on the way to the lighthouse, Steamer Lane, and the Boardwalk. Enjoy outdoor seafood bars, many restaurants on the pier with seals to watch in the water below. 40 minutes to Monterey and its famous Aquarium and Cannery Row. A little further South to Carmel and Big Sur. Take Hwy. 1 North for a magnificent 1.5-hour drive to San Francisco. Other Activities: Walk along West Cliff Drive, above the Pacific.